Visit us today for all your custom clothing needs! WELCOME TO Q. CONTRARY, WHERE WE COME TO YOU! 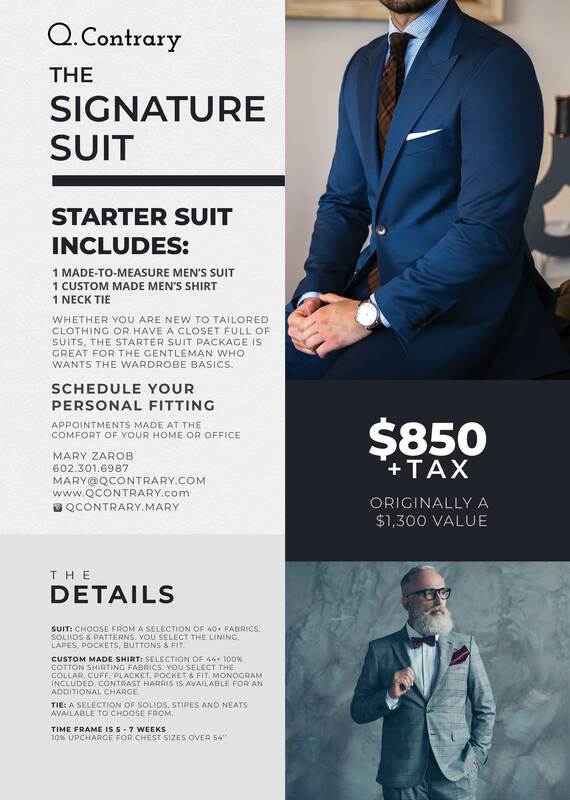 Mary Zarob is a New York-trained designer and stylist, who helps men and women find clothes that fit properly and make them look their best. Mary knows that style is a personal expression, and she works to cultivate this for every client. 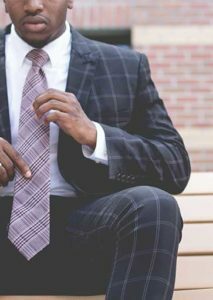 She helps men and women develop a personal style that is unique and distinctive. While it is easy to go to a store and buy exactly what is on the mannequin, that look doesn’t work for everyone. Q. 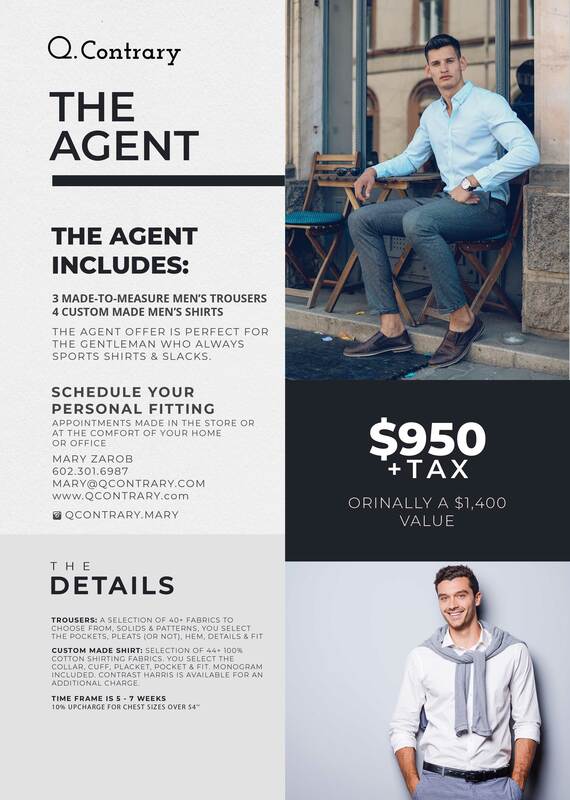 Contrary helps educate our clients on what compliments their body type, what colors accentuate their features, and how to build a wardrobe that allows you to conveniently pull a look put together. 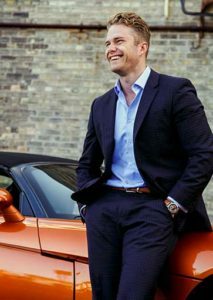 A Bespoke suit is one that has been crafted almost entirely by hand. 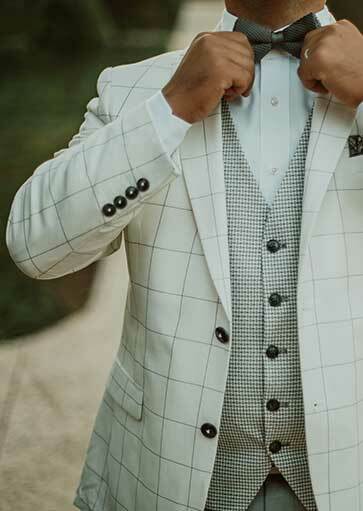 The pattern is handmade to the specifications of your body and the garment is hand cut by a skilled tailor exclusively for you. The buttonholes, pick stitching, pad stitching, lining, sleeves, and more are all hand sew by a tailor here in the US. Q. Contrary partners with master tailors who are trained with 40+ years and truly know the old world tailoring process. Finding the right look on your special day can be overwhelming. Let Q. Contrary take some of the stress away. Mary recommends you start creating a Pinterest page or saving images of looks you really like so she can see your vision. She will then help design a suit, jacket, tux, vest, shirt, etc for your day. She’ll help you select the right fabric, color, fit and all the details for your custom wedding attire. Together, you will create a vision that compliments your significant other while making you look your best. Men and women today like a sleek, fitted look to their shirts. Nearly 70% of the shirts off the rack today are slim fit. Off the rack shirts will shrink nearly a quarter to a half an inch after 4-5 washings. If you have ever had difficulty buying a shirt that fits, custom shirts will solve that problem. Custom shirts also provide variety and personality to your style. 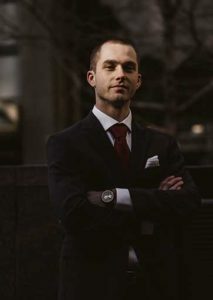 Our custom shirts are made one at a time to fit you throughout the body including the neck, chest, waist, hip, shoulder, sleeves, cuffs, and length. Q. Contrary firmly believes that a custom jacket will do more than make you look good, it will make you feel good, too. 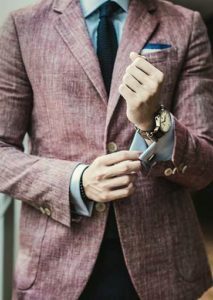 Having a jacket that is tailored to your lifestyle and physique can raise one from the masses of generic fashion to the height of individual style and self-confidence. Buying clothes off-the-rack is great for convenience, but not always a perfect solution when it comes to fit and finish. Simple changes can make existing pieces more comfortable and more in line with your current style. Mary will come to your home or office, fit and pin/chalk as needed, and deliver the finished items when completed.